‘Mom, how did we first come to Earth?’ It’s my son (why does he always manage to ask questions like this from the back seat of the car?). I gawp at him in the rear vision mirror; aren’t four and three quarter year olds supposed to ask easier questions? I’ve already had to field: why is the sky blue, what does guilty mean, and who made the first plants and animals? But to answer this particular question, whilst hurtling at 120 kilometres an hour along the N2 towards Swellendam with one of those almighty new BMW thingies practically inside my boot, is, well, not the most opportune moment, really. I take a deep breath. And nothing happens. My brain and mouth aren’t quite managing synchronisation. Fortunately I have Patty in the back seat with us. Patty is our family friend who has joined us for the journey. She’s one of those individuals that you order in the party pack along with your child – sort of like a fairy godmother who appears at the right moments to take the edge off, and usually manages to apply the right dose of consumate confidence to any given situation. She also manages to skirt the issue with amazing aplomb. Something I am not given to doing. Particularly not with my child. And before he can get a word in to correct her, because, after all she has changed the subject a bit, she launches in, keeping us all riveted as she manages to talk about early man, caves, perforated shells and Middle Stone Age deposits that date back more than 75 000 years. She has mentioned numbers. She has my son gripped. Patty transports us back in time to the findings at the Blombos Cave, a beach cave close to Stilbaai, not that far away from our designated stay at De Hoop Nature Reserve, that prove modern man is much older than originally thought. Not only that, the cave art discovered here is older than anything previously found. At least twice as old as any cave paintings throught to be the earliest works of art. I am used to South Africa being sited as the Cradle of Humankind. After all, Johannesburg’s Sterkfontein cave lays the claim to evidence of earliest man. But the evidence uncovered at Blombos tells another story. 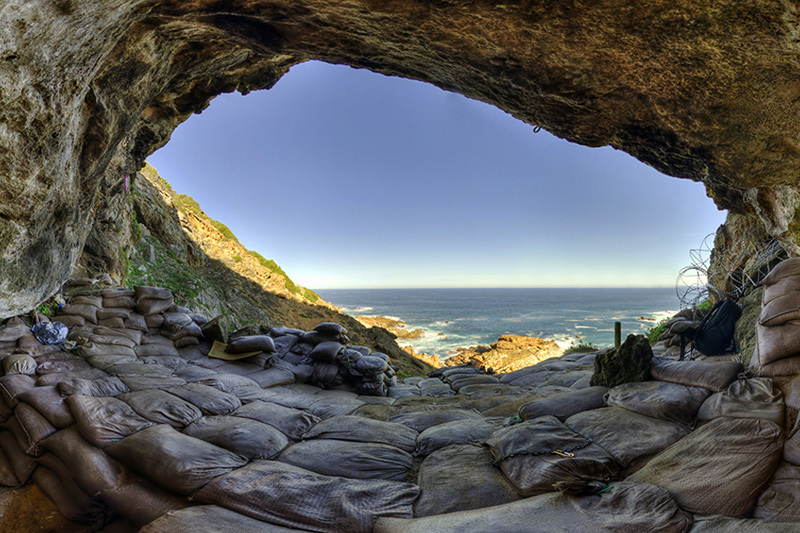 This remote cave just above the wave line on the coast near Stilbaai holds evidence that those characteristic behaviours we regard as ‘modern’ amongst man (such as abstract and conceptual thought and speech) were around a lot earlier than we think. Tens of thousands of years to be precise. Carvings were found on a slab of red ochre. Scientists used a technique called thermoluminescence, which allowed them to study the actual grains of sand associated with this ochre. It meant they could then date the carvings found in the cave. They are at least twice as old as cave paintings previously thought to be the earliest works of art. The markings on the ochre are considered abstract. And they were probably communicated from one person to another. This would have happened verbally. More than 8 000 pieces of ochre with these thema bearing signs on them were found in the cave. To look at, the blocks of ochre are little other than abstract scratches made on a slab of clay. But scientists believe these have been deliberately carved and hold some symbolic value, or certainly had some meaning for those who carved them. Contrary to poular belief, humans back then were not just a bunch of thugs, they actually produced works of art. By now my son is interrupting with questions about writing and what it looked like. Were there numbers? (he’s just started doing sums at school). But Patty entertains us to further evidence. It seems that there were also shell beads that add further evidence to modern human behaviour. Each of the 65 beads was carefully pierced using a bone tool to create a keyhole space. In order to communicate the symbolic meaning of bead work and abstract engravings, a full syntactical language is necessary. I’m now interested. Can we visit the cave? The Blombos Cave lies south still from Jongensfontein, just around a little peninsular in a south easterly direction from Still Bay West. It isn’t the only cave that has undergone excavation in the area. The Robberg Cave in the Robberg Nature Reserve is one of the only caves open to the public, but that is all the way up near Plettenberg Bay and hardly close enough for us to visit. You can visit them, Justin at De Hoop assures us when we finally arrive, but you need to make an appointment with an authorised guide. South Africa was only lucky enough to learn about the findings because the entrance to the cave had been completely sealed up by a deposit of dune sand. The cave had been totally undisturbed for almost 300 years because of its isolated location. By now we’ve moved on to the two explanations I choose to share with my son as to the origins of man. One, we evolved from apes (he really likes this one), or we were ‘made’ by something greater than ourselves (which is a little beyond him). I’m not stooping to the grey-bearded man in the sky theory just yet. His cousins will explain this one to him, while he interjects with the monkey story. I grin to imagine the repercussions. (To see more photos google “Blombos Caves” and then select images). Hello, is it possible to arrange a visit to the Bolombos caves? If so who do I contatc? It is great that you are putting these archeological sites on the map for our tourists in such an entertaing way.